a reader's words: Towards a Socialist South America? Towards a Socialist South America? 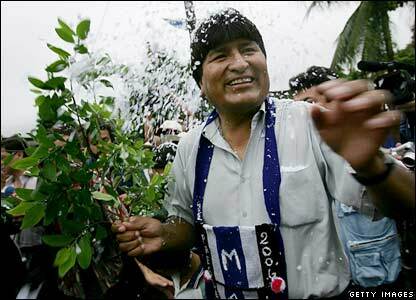 Evo Morales becomes the first indigenous President of any country in South America. An interview with Evo Morales here. There are many progressive leaders in Latin America right now; presidents like Fidel and Chavez, but also Kirchner [in Argentina], Lula and Tabarez Vasquez [in Uruguay]. The social movements are very strong and interesting and they move from union struggle, to local, to national struggle. If the 19th century belonged to Europe and the 20th century to the United States, the 21st century will belong to America, to Latin America. I have a vision of integration, like the European Union, with a single market and a single currency and with the corporations subordinate to the state. ...... The state has to be the motor: We will nationalise the forests and the petroleum and natural gas reserves. In several cases the management of the companies has been disastrous. To develop the country, we have to get rid of the colonial and neoliberal model. We want to tax the transnationals in a fair way, and redistribute the money to the small- and medium-size enterprises, where the job opportunities and ideas are. To get this on its way, we want to create a development bank. The properties of big land owners will have to be redistributed; we’ll respect the productive land, but the unproductive land must be handed out to landless peasants—this will start a true process of economic redistribution. We also want to industrialize and give people more access to technology. "Goodbye and good riddance", said Buenos Aires' resident Gabriela Garcia on hearing of the plan to pay off the country's IMF debt lump sum. ... Help is also on hand from oil-rich Venezuela, which recently purchased around $1bn in new Argentine government bonds. Venezuela's firebrand president, Hugo Chávez, is reported to have pledged an additional $2bn to assist Argentina's attempt to rid itself of the IMF. Although the country will not cancel its membership to the lending organisation, most Argentinians welcome the prospect of waving goodbye to the lender's presence in domestic affairs. Like the president, many blame the IMF's neo-liberal recipe of market reforms and public spending cuts for the economic crisis. "We have extricated ourselves from a monster hanging over us. This debt, although we've said it was illegitimate, is a debt all the same," said Estela de Carlotto, a spokeswoman for Grandmothers of the Plaza de Mayo, an influential human rights group.